This tool evaluates the hyperbolic cotangent of a number: coth(x). Enter the argument x below. 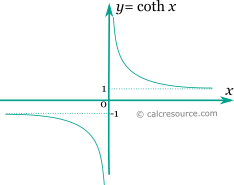 The graph of the hyperbolic cotangent function is shown in the figure below. Unlike the trigonometric cotangent, the function is not periodic. The above series converges for \( 0 < |x| < \pi\). Bn denotes the n-th Bernulli number .